Though Fraley Memory Productions is considered to be one of the top photography studios in the greater Akron, Ohio area, they’ve recently started to expand their offerings in order to better serve their clients. What’s really exciting is the fact that this local business is now working on drone video projects for individuals in Cuyahoga Falls, Ohio; Fairlawn, Ohio; and beyond. Those interested in wedding videography, sports highlight videos, and even festival filming can now get an aerial shot of their events by enlisting the help of Fraley’s team. The latest addition to Fraley Memory Productions’ extensive list of services can benefit a wide range of people. 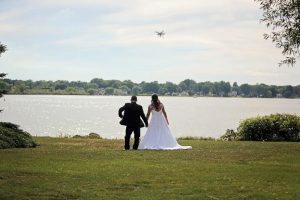 For couples planning their upcoming nuptials, a drone video project is a great alternative to traditional wedding videography as it provides a bird’s-eye view of the ceremony. Those who hire Fraley Memory Productions to document their big day can look forward to receiving an expertly filmed and edited video of their vows from a number of different angles. Not only is this option much more unique than the standard wedding videography offered by other photography studios, but it gives couples the opportunity to see the event from a much wider angle. It’s important to note that engaged couples throughout the greater Akron area aren’t the only ones who should consider taking advantage of this new service from Fraley Memory Productions. A drone video project is also an excellent option for those interested in making a sports highlight video. Though Fraley’s team has captured fantastic images of teams like the Rubber City Rollergirls, aerial filming now allows them to create action-packed videos that can be shared on websites and social media. Even high school athletes looking to get recruited by a college team can put together a stunning sports highlight video that shows off their skills with Fraley’s help. Since Fraley Memory Productions began offering drone video projects, this local photography studio has also been recruited by organizations throughout Fairlawn and Cuyahoga Falls interested in festival filming. 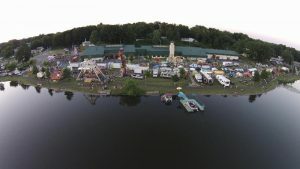 For the 2016 Rock the Docks festival, Fraley’s team took aerial footage of the event using their DJI drone. The results were well received by all of the participants as well as those who attended the event, demonstrating the value of festival filming for those looking for a unique form of event promotion. Though residents throughout Akron, Ohio; Fairlawn, Ohio; Cuyahoga Falls, Ohio; and beyond are interested in using Fraley’s new service for wedding videography, sports highlight videos, and festival filming, there’s no limit to what this local business can do. To learn more about drone video projects from Fraley Memory Productions, visit www.fraleymemoryproductions.com. Additional questions can also be addressed by contacting the photography studio directly at 330.608.5865 or 330.703.9228. This entry was posted in Photography, Videography and tagged drone video projects Cuyahoga Falls Fairlawn Akron Ohio, festival filming Cuyahoga Falls Fairlawn Akron Ohio, Fraley Memory Productions, photography studios Cuyahoga Falls Fairlawn Akron Ohio, sports highlight videos Cuyahoga Falls Fairlawn Akron Ohio, wedding videography Cuyahoga Falls Fairlawn Akron Ohio by admin. Bookmark the permalink.